Anthony’s Shade Sails have been expertly designing, manufacturing, and installing custom shade sails and umbrellas on the Gold Coast since 1996. 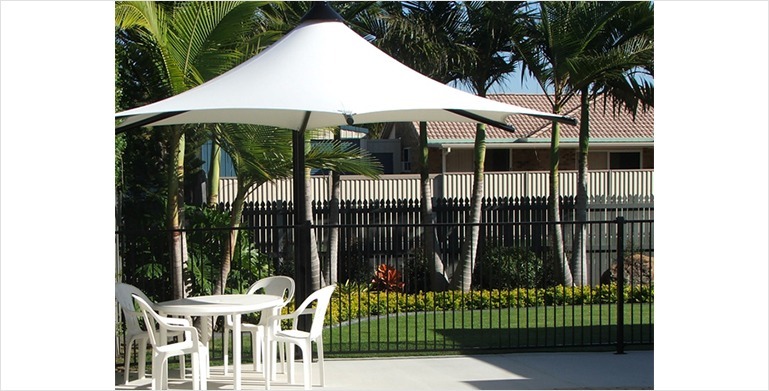 We have installed umbrellas for many thousands of satisfied Gold Coast clients, both commercial and residential. We can help you create a beautiful umbrella for your home or business to give you a perfect shaded area for anywhere where people gather. Around a BBQ area, patio, by a pool, over an outdoor table setting, umbrellas are an attractive hade option. Our umbrellas have a W41 wind rating which means they are wind rated for up to 160 km/h winds. That’s considered cyclone proof, so they will easily withstand Gold Coast weather, even when we get the aftermath weather from cyclone’s off northern Queensland. Our waterproof canopies are made from a PVC material and have a 5-year manufacturer’s guarantee. The shade cloth we use on our umbrellas have a 10-year manufacturer’s warranty. We have a 12-month workman ship guarantee on all our umbrellas, shade sails and canopies. Umbrella canopies can be washed with regular detergent and are easy to keep clean. We can custom build an umbrella for almost any size area. We can install flanged bases which are fixed to concrete or tiles, perfect for patios and veranda areas, or we can install an inground base. Inground bases are dug directly into the ground with a concrete filling to secure it. Choose your own style. Choose from a hexagonal shape (6 sided) or a square (4 sided) umbrella in any colour from our extensive range. The structure is made from galvanised steel with a powder coating flange post and spider (spokes). You can choose any colour from our extensive range. Our umbrellas are perfect for shade, and offer 100% UV protection. We have a cantilever design option which is perfect when you need space to put a table and chairs or even a BBQ underneath. We have a centre post option also which can be fitted into an existing table. Whatever type of shade solution you’re looking for we can help you with. We design and manufacture everything right here on the Gold Coast. Call us Monday to Saturday to arrange a free measure and quote at your home, business, or commercial property.